Save an extra CDN$ 7.86 (27%). Buy the Kindle Edition instead. Comment: Like new. Excellent condition. Small smudge on cover but otherwise perfect condition. Shipped by Amazon and with Amazon Prime. Start reading Eats, Shoots & Leaves on your Kindle in under a minute. 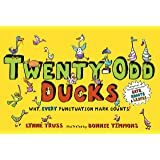 Who would have thought a book about punctuation could cause such a sensation? Certainly not its modest if indignant author, who began her surprise hit motivated by "horror" and "despair" at the current state of British usage: ungrammatical signs ("BOB,S PETS"), headlines ("DEAD SONS PHOTOS MAY BE RELEASED") and band names ("Hear'Say") drove journalist and novelist Truss absolutely batty. 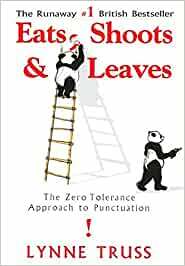 But this spirited and wittily instructional little volume, which was a U.K. #1 bestseller, is not a grammar book, Truss insists; like a self-help volume, it "gives you permission to love punctuation." Her approach falls between the descriptive and prescriptive schools of grammar study, but is closer, perhaps, to the latter. (A self-professed "stickler," Truss recommends that anyone putting an apostrophe in a possessive "its"-as in "the dog chewed it's bone"-should be struck by lightning and chopped to bits.) Employing a chatty tone that ranges from pleasant rant to gentle lecture to bemused dismay, Truss dissects common errors that grammar mavens have long deplored (often, as she readily points out, in isolation) and makes elegant arguments for increased attention to punctuation correctness: "without it there is no reliable way of communicating meaning." Interspersing her lessons with bits of history (the apostrophe dates from the 16th century; the first semicolon appeared in 1494) and plenty of wit, Truss serves up delightful, unabashedly strict and sometimes snobby little book, with cheery Britishisms ("Lawks-a-mussy!") dotting pages that express a more international righteous indignation. I read this book after reading a truly hilarious book on French grammar - "Au Bonheur des Fautes" - written by a copy editor of Le Monde newspaper. She quotes some gems from this book, so I decided to read it as well. I learned quite a lot from this book, but it is definitely not hilarious. There is no clear explanation (maybe I missed it) of the title, except that the meaning changes when you change the commas. 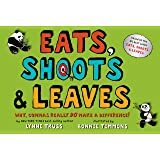 Some old joke about a panda eating shoots abd leaves I understand. Anyway, you won't get your apostrophes wrong any more after reading this book. It applies to US-english too. This was a rather entertaining book with amusing examples. I was going to give it four stars, but the final chapter just irritated me that I had to drop it down to three stars. Every time I hear someone complain about online communication, texting, and emoticons, I roll my eyes. There was a sentence near the end of the book mentioning that people who love punctuation must hate emoticons. Ahem, I adore punctuation too (semicolons are my favorite punctuation), but I love emoticons. It's quite annoying to hear people diss emoticons and digital communication. I understand where her fury is coming from, but honestly, not all of us pro-technology folks are that clueless about punctuation and grammar. Another thing that made me like the book less, was that there were some jokes that I really didn't appreciate. Yes, I know humor is subjective, but I thought some of the jokes were frankly quite offensive or even cruel. Nonetheless, this was a funny read overall. catchy title and well-known for that reason, but author often contradicts herself by not following her own advice in the text. Also, several people I know who are solid English speakers but looking to fine tune their English as a second language also found this confusing. It has some good witticisms but not good for sound advice on grammar and sentence structure. 5.0 out of 5 starsGreat humour and helpful to boot! Funny! This book will have any punctuation proud person laughing. I had to stop reafing during my flight as I was laughing too loudly. This little book makes a great gift for any student or anyone at all who just loves words. It's fun but, at the same time, incredibly instructive! We have a couple of copies in the house and both of us have it on Kindle as well. Excellent! 4.0 out of 5 stars! A fun read and an excellent review of grammar. I'm not a stickler, but now have new material for my punctuo-missionary work! It should be required reading for undergrads in the sciences! great read on what would normally be a a boring topic- punctuation. Injected humour, historical info and clear writing (note the omission of the serial comma) help clear up our misuse of these small but vital inclusions to writings. fantastic book for anyone looking to improve their writing skills! !